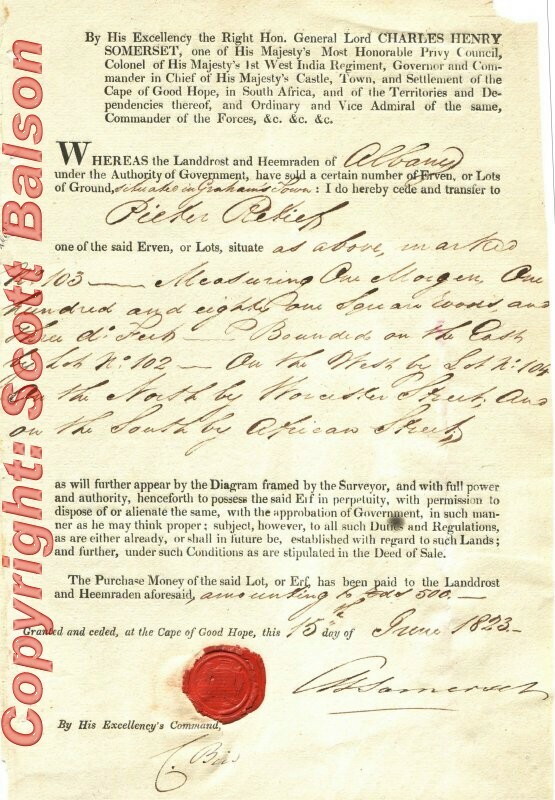 I was delighted to find positive proof that the document I bought some years ago on eBay IS the original title deed for one of the many properties acquired in Grahamstown by Voortrekker leader Piet Retief in the early 1820s. It was largely due to Piet Retief's financial problems resulting from property purchases like this that he started on his Great Trek. So this is a great artefact to have in my large collection of early South African books and documents. I love old documents, what else do you have from famous individuals? Thrilled you have the proof - congratulations on having that piece of history! I also have the original signatures of Livingstone, Moffat and Campbell (all RSA missionaries from early 1800s); a handwritten letter signed by Baden Powell (Mafeking); Mandela (of course) and postcard from von Lettow Vorbeck (German General in German East Africa - world war one) among many others. When was the postcard from von Lettow Vorbeck written? Can’t you post an attachment? I have studied Jan Smuts extensively (I have many letters and envelopes regarding him) and I always find it amusing that von Vorbeck actually ran rings around Smuts during Word War 1. Smuts, down in Johannesburg, who always had profound respect and admiration for Vorbeck and was determined to give him help. He worked out an arrangement whereby Lettow-Vorbeck, an enemy general, received a pension from the victors! He continued to receive this pension until his death on March 9th, 1964. I am a bit jealous. Letters, postcards, notes, etc, from and to Smuts are relatively common. Smuts basked in his own glory. Items from Lettow-Vorbeck are a different story. What we all know, but what we should never forget, is that von Lettow-Vorbeck was never defeated. He surrendered because Germany surrendered! Slightly off the subject, do you know of any postal history (letters or postcards) from his period inside Mozambique or (the then) Northern Rhodesia? I know that it is highly unlikely that any might exist, but I am forever dreaming. Lovely! I am no autograph expert, but there is no reason to believe that it is not genuine. My collection is in my shop and I will check it out on Sunday. As I have said, Smuts loved the glory. I will bid on the item, but please remember that Smuts had a career that spanned nearly 50 years. He wrote thousands of letters and signed thousands of cards. Nevertheless, the items signed in his personal (non professional / political) capacity are a lot scarcer.